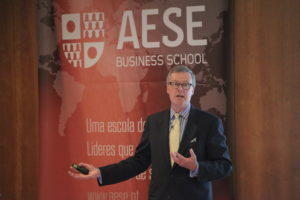 I recently had the privilege to deliver a keynote presentation to the alumni of the AESE Business School in Lisbon, Portugal. The talk came in the wake of the Brexit vote and violence in numerous locations around the world so the topic of “leading in turbulent times” was on everyone’s minds. We discussed ARTful leadership–building adaptive capacity, resilience, and trust into organizations as an antidote to constant turmoil. I found the AESE alumni an interesting group with whom to engage. Portugal is a bit of an undiscovered gem in Europe. Might it be the next Ireland (with better weather)? Much of the population speaks English, Portuguese, and a mix of other languages, costs are reasonable, and flights to the U.S. and the rest of Europe are relatively short. With the right technology infrastructure, it could become an innovation hub. Just look at what Gibraltar is trying to their south, an effort now hampered by Brexit. If Portugal moves in this direction, I’m sure that AESE and its alumni will be at the center of the effort.